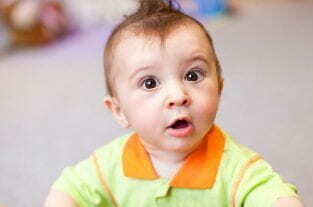 Most parents share photos of their kids online. When you have friends and family spread out across the world, social media is a great way of letting everyone know what you’re up to. Many parents use it as a way of capturing special memories. You might share photos of your kids looking adorable, of them being mischievous or just of your family having a lovely day out. Sharing on social media has become so normal that it’s not something many parents give much thought to, but should you be taking precautions to protect your photos online? Do you think before sharing or is it just second nature to share your day with the friends you’ve connected with online? Digital kidnapping may sound like a crime from a futuristic sci-fi movie, but in fact it’s a modern day reality. What does it mean? Digital kidnapping is when someone steals images of your child online. 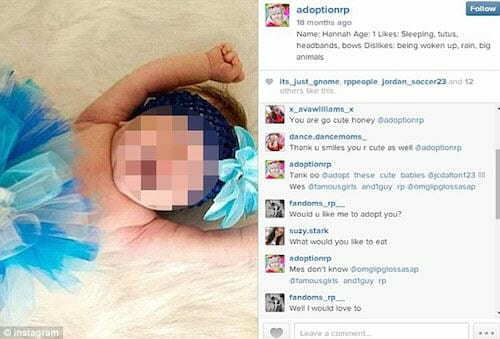 There’s a craze called ‘baby role playing’ in which users steal photographs of babies and young children online. These images are then reposted on Instagram along with elaborate storylines about why that child is up for ‘adoption’. Other users will then comment with offers of good homes, and this role play continues until the users lose interest. Many of these roleplayers are teenage girls living out relatively harmless teenage fantasies, though these is a much darker side to this trend. Some of the threads do contain talk of violence and abuse. Rest assured, the above account was reported and removed. But even the most harmless adoption fantasies would leave many parents feeling uncomfortable. When you share images of your child with friends on social media, you simply don’t expect those images to be stolen and used for anything else. It’s an unpleasant thought, and many parents have been outraged to discover images of their children used this way. These stolen images can be reported to Instagram in the hope of having them taken down. As you may already be aware, this can be a timely process with many social media companies taking a while to process complaints about inappropriate or stolen images. To reduce the risk of digital kidnapping in the first place, you need to take steps to protect your images online. Making it more difficult for people to access and use your images is the best way to prevent digital kidnapping. Setting your profile to private, and making sure that your images can only be viewed by your ‘friends’, can reduce the risk of your images being stolen. Make sure that your social media settings are set to private and that only friends can see what you share. This will prevent your images from appearing in searches, and will reduce the number of people who can access your photos. If you’re a social media butterfly, it might be time for a friends cull. Take a look through your list, and get rid of anyone you don’t know or trust. If you share images for friends and family, make sure they’re the only ones who can see those images. Even if you are stringent about online safety, photos of your kids could still get stolen if your friends and family don’t apply the same rigorous rules. If your mother-in-law shares an image and doesn’t have her security settings set to private, her image of your child could be visible in public searches. If you’re worried about this, ask friends and family to set their privacy settings to private as well. If they don’t want to, then simply ask them not to share the images on social media. Professional photographers often watermark their images to protect them from theft. Designers also use watermarks as a way of protecting their work. You may find that using a watermark offers you an added layer of protection. A watermark makes it clear who the image belongs to. Watermarks can be added using photo imaging software or online photo editing programmes. You’ll need to add the watermark strategically so that it can’t be cropped out of the image. Unfortunately though, watermarks can be removed by a skilled designer. So if you’re not comfortable with a particular photo possibly being stolen, don’t post it at all. If you want to check if your personal photos are being used elsewhere, you can use Google’s reverse image search, or sign up for a service like Face Guardian. Face Guardian connects to your Facebook page and scans for your photos across the web. If you find images being used inappropriately, you can lodge a DCMA report to Google, if you’ve requested the person to remove the image and they refuse or do not reply. Digital kidnapping is quite scary, but taking the steps above could help to protect your images. Think carefully about what you share on social media, and how you can keep yourself and your family safe whilst continuing to enjoy the friendships and community that social media allows. Check out BellyBelly’s humourous article 13 Types Of Mothers You’ll Find On Social Media.